Environmental watering in the lower Broken Creek in 2014–15 continued to focus on providing flows to protect and improve native fish populations. Meegan Judd, Environmental Water Officer with the Goulburn–Broken Catchment Management Authority, said environmental watering improved fish habitat and fish passage during the migration and breeding seasons. It also helped manage the threats to fish from excessive growth of azolla (an aquatic plant which can cover the water surface and decrease oxygen levels in the water). "Low dissolved oxygen prevents fish from breathing, with excessive azolla growth dramatically reducing the amount of suitable habitat and potentially leading to fish deaths," Meegan said. "There were increased levels of azolla growth between September and November 2014. However, consumptive water, being delivered through the lower Broken Creek on its way to water users, flushed the azolla through the system." "This is a great example of how consumptive water can achieve environmental benefits en route." Meegan said large-bodied native fish continued to thrive in the Broken Creek system in 2014–15. "While dissolved oxygen levels did fall in some periods during the year, there were no apparent impacts on native fish populations," Meegan said. 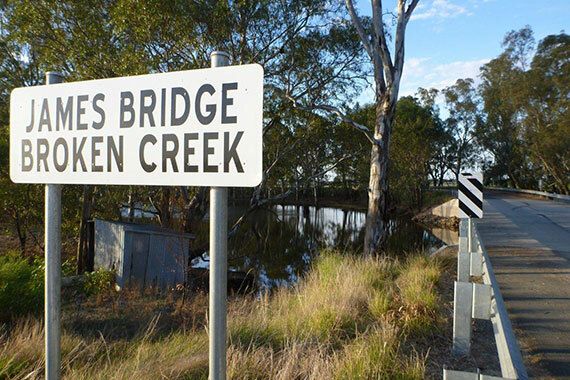 "In fact, large-bodied native fish continue to be found along lower Broken Creek, including Murray cod, golden perch and silver perch, with some fish moving along the creek through the fish ladders."